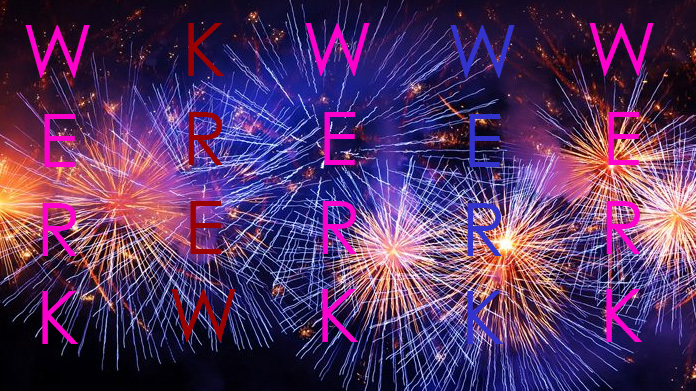 Well, as 2017 draws to a close, it seems an appropriate moment to look back at just some of the highlights of the year here in the land of Hope&Glory and to reflect on some of the weird and wonderful and – above all – successful (though we do say so ourselves) things that the team got up to. The year started on 1 January with our first New Year take over for adidas as every influencer in town got on board with our campaign to show how they are #heretocreate in the New Year and inspire their fans and followers to set their goals and reach them as the year dawned. 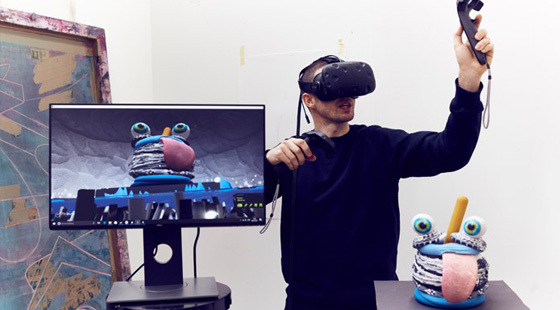 We also launched our (now multiple award winning) “Virtually Real” campaign for HTC Vive as we buddied up with the Royal Academy and, in a world first, created a series of Virtual Reality artworks that were then 3D printed and exhibited to show the power of the new technology. We launched the Airbnb Pantone House. 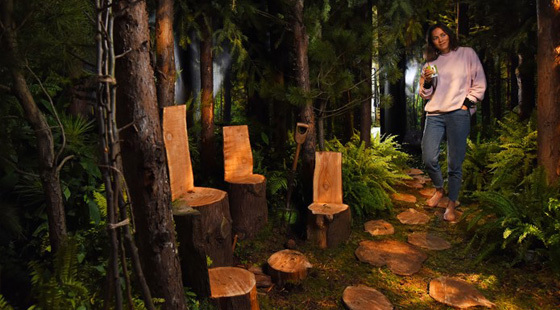 Celebrating the colour of the year (forest green), we brought the outside inside and created a house that celebrated all things green with a host of activities for those who came along to the experience – learning all about Airbnb along the way. We hit March hard with the launch of our first campaign for Marie Curie. 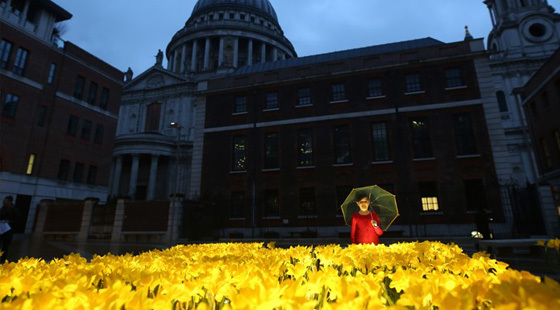 The Garden of Light – in London’s Paternoster Square and featuring thousands of illuminated daffodils, each representing a Marie Curie nurse who brings light to those living with terminal illness – was a raging success. 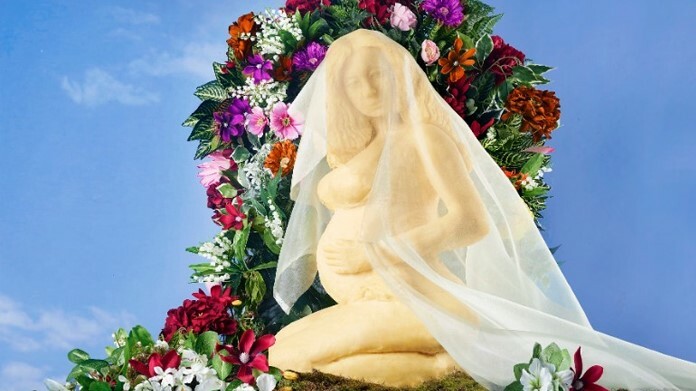 One of the weirdest things we did this year (actually, one of the weirdest things we have ever done) was the creation of a statue of a globally famous pop-star’s Instagram pregnancy announcement. We of course christened her Brie-yonce. It went global. we couldn’t move for coverage. 12,000 people rocked up in East Village, E20 to see her. It was the best fun possibly ever. The month continued apace as we launched the latest range of Beatrix Potter coins from The Royal Mint. At one point, the queue to buy them on the Mint’s website was 14,000-strong – every one of them drawn by some truly stand-out media coverage for the coins. April kept rolling as we created a pretty epic little film for Sony in the latest iteration of our “Sound So Loud You Can See It” platform for their speaker ranges. We hurled two snowboarders down some slopes with the speakers and LED light suits and created a film that was viewed several million times across Europe and generally delivered media acclaim. The month didn’t end there, however, as we went out with our IKEA FRAKTA work. When Balenciaga brought out a bag that looked suspiciously like the iconic Swedish blue bag we were fast. Several thousand pieces of coverage later we had a piece of newsjacking that got everyone talking and took the humble IKEA carrier into high fashion. The merry month of May started with another slice of oddity as we made a PowerFist from the year 40,000. 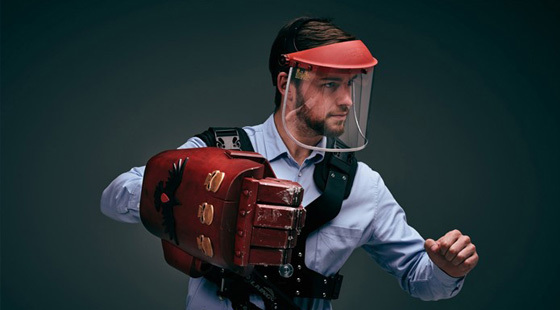 We worked with SEGA on the launch of their latest title set in the Warhammer 40K universe and brought one of the iconic weapons from the title kicking and screaming back to the 21st Century. For our next trick, the team added to what was by this stage becoming an ever-growing list of awards (we did relatively well this year by our usual standards) with a Silver Gilt for our IKEA Garden Rooms at Chelsea Flower Show. The room, which showed how to live with plants was a raging success quite apart from its award. The month of June was a bit mad. Hugely successful, but slightly busy. Next up, we listed the country of Sweden on Airbnb. The whole of Sweden. The country wanted to celebrate its “freedom to roam” regulations which mean that anyone can sleep just about anywhere across the Scandinavian nation. Needless to say, the whole thing went a bit nuts and we were soon swimming in coverage from across the globe. 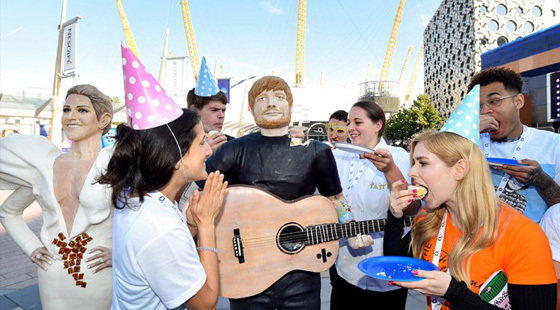 From the sublime to the ridiculous, we made Gingerbr-Ed Sheeran for O2. It was to mark the anniversary of a certain iconic London live experience venue becoming The O2 – as well as the telecom brand signing up to maintain its ownership of the space for another ten years of remarkable live moments. Speaking of clients with an interest in live music, our “Food For All Seasons” campaign with Deliveroo also had rock n roll moment. We launched Glastonbury Riders service on the platform – enabling people to order the riders requested by the three headline acts at Glastonbury. We had a lot of Gatorade kicking around the office to satisfy the demand for the Foo Fighters’ rider (which contained 94 bottles of the stuff). Things didn’t stop there for Deliveroo. For our next trick, we made the Game of Thrones “You Know Nothing John Dough” bakery. Signing up cult character Hot Pie to offer his signature Direwolf Bread to customers on the site we made international news and delivered a neat and sweet 500 pieces of coverage around the world – not to mention international talkability for the premium food delivery brand. In the meantime, elsewhere in the office, the HTC team was working with Tom Daley to create Squeezable Selfies while the diver launched himself from a diving board at the Olympics Aquatic Centre in east London. The campaign for the mobile handset maker’s flagship device was a roaring success and not only delivered a raft of coverage but also an uptick in sales. Which is what it’s all about at the end of the day. As the second half of the year gathered pace, Game of Thrones became the gift that kept on giving. 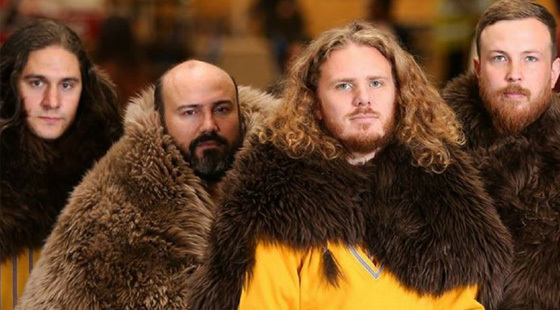 Team IKEA scored another global hit (a search for IKEA Game of Thrones Rugs returns 1.1 million results on Google, which is not a bad sign of success). Spotting that a costume designer from the show announced they’d use SKOLD and LUDDE rugs from IKEA for capes, we grabbed some quick photography and went global once more for the brand. On a rather different note, August saw us create our biggest campaign to date for adidas. We welcomed 350 influencers and media from across London and from across the world to the launch of the latest adidas Athletics collection – Pulse. The event was a beast as we had 30 international athletes in to talk about the collection and adidas designers to talk about how it was inspired by the leading sportspeople’s experiences in competition. On a rather different scale altogether, we launched Mercure Hotel’s pet-friendly approach to man’s best friend by creating Canine menus at a couple of their hotels. With an awesome photoshoot we went across the national onlines and print titles – from the news to the travel pages. Deliveroo had a pretty stellar year in 2017 and the next campaign – Seaside Deliveries – was another mini-triumph. 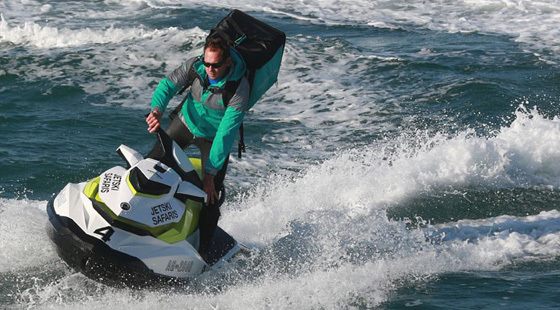 We arranged Jet Ski deliveries for a couple days on Bournemouth beach, ensuring holidaymakers could stay well-fed as they soaked up the last of the summer sun. A quick photoshoot and we’d nailed eleven pieces of national coverage – print and online. For Meantime, we created “blendable beers” with the launch of our Latt-Ales. A Milk Stout and an Espresso Porter were brewed and bottled separately but could then be combined (in the proportion of the drinker’s choice) to make Latt-Ales (or Flat Whites or a pseudo-Americano). The social videos for the campaign were viewed some 2 million times across the internet. We built the IKEA House Party and hosted 3,000 people who marked the brand’s thirtieth anniversary in the UK. The four storey town house was an exhibition of UK living by day and then turned into a series of house parties with decade-by-decade theming – from Smirnoff Ice and Fosters to Hooch and Lambrini. The whole thing landed five double-page spreads and features, sparked scores of homages to the brand from the media and got people engaging with a brand anniversary. Next up, we bagged a ton of coverage by announcing that Argos would arrange 00.01 deliveries of the all-new (and much sought-after) X-Box One X. We managed to twist some arms to make the deliveries happen and got one over on an internet giant in the process. Not to mention generating a ton of coverage and finding a cheeky way to bring the brand’s delivery message to life. For our next trick, we launched “Interview Rooms” for Barclays. Having found that it costs someone around £500 just to do the interviews required to land a first job (travel and accommodation the biggest costs), we created Barclays-BnB with the offer of a free room for job hunters so the bank could help them land their dream first role. The next step for November was to bring back another iconic kids’ show for Cartoon Network. We enlisted the services of Maya Jama to take the role of Penelope Pitstop and found some real life versions of the iconic cars to bring back Wacky Races. A photoshoot and some interviews later and we’d got everyone talking about the new show’s return. Sticking with the kids and animals theme that seems to have been on-going through 2017 in Hope&Glory, we launched the Guinness World Records “Fluffytorium” – the world’s fluffiest cafe. It was built to mark the launch of GWR’s Amazing Animals compendium. By all accounts, the whole thing worked famously as sales spiked alongside the launch of the PR. Next up, bstruck another partnership, this time with LEGO. With the offer of “A Night At …” the LEGO House in Billund, the global media went crazy, the UK media went crazy, there were hundreds of pieces of coverage, thousands of applications to stay and a good time was generally had by all involved. In a month of pop ups and experiences, our next job was to open the Whole Earth Nut Butter Fondue Bar (aka Nut-ing Compares to Fondue as it was christened). Well over 150 pieces of coverage and 2.5 million video views (thanks UniLad, Lad Bible, Stylist, Culture Trip, Buzzfeed and Food Envy) later, we had a raging success on our hands. Things didn’t really get quieter. Team Deliveroo rounded-out a strong year with the launch of their latest baked goods-based campaign. We invented the Ba-Coffee Roll as the ultimate hangover food – bacon sarnies in a roll infused with five shots of espresso. The media went nuts, there was coverage everywhere and the rolls sold out. We made sure that everyone was talking about Argos on Black Friday. Alongside a couple of dozen deals press releases issued and bags of coverage secured, we also launched MewTube – a stream of kittens on the retailer’s website to help calm frayed Black Friday nerves and keep the nation calmer on one of the busiest days of the year for shopping. The year was seen off on a rather more meaningful note. We created the Marie Curie Memory Tree. 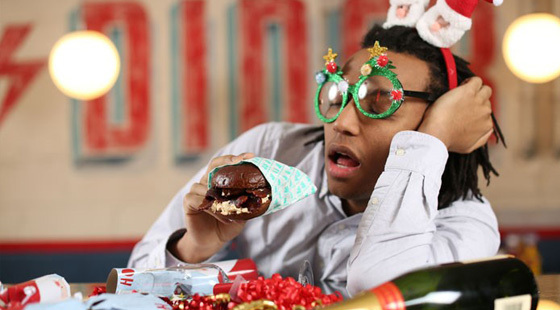 Christmas is a rough time for those who have lost loved ones. So we created a tree on which the lights glowed brighter when people shared fond memories of those they would miss over the festive season. There were over 2,000 tweets and the lights on the tree shone bright through the month to bring our year to a close.